Fins and Things Trail information. Download a map and plan your dirt bike ride in Moab. Fins and Things... named from the way the sand stone is carved into the earth. The 'Fins' or razor backs as we call them run parallel of each other and the trail takes you up and over a lot of them. The trail is well marked with tire tracks because of its heavy use by the jeeps and dirt bikes. Fins and Things mostly slick rock with a bit of sandy 4x4. Most of the trail is on the North side of the road but there is a bit of trail on the South side as well. We have a blast on this trail. We've done most of it at night and that makes for a whole new challenge. 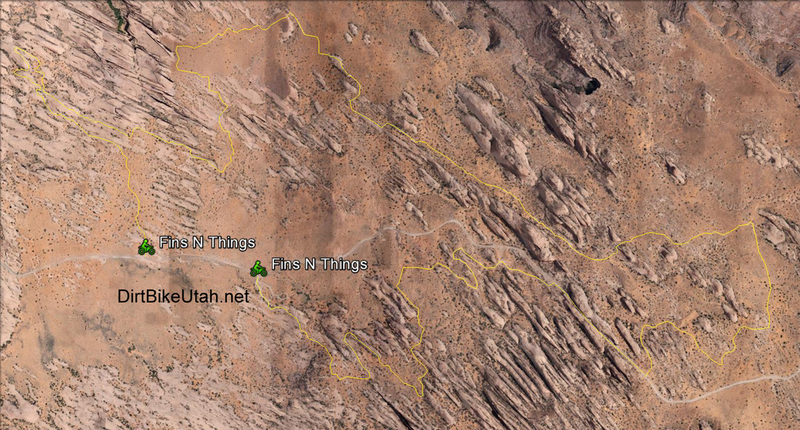 Directions to Fins and Things: From 191 in Moab, head east on E 300 S Street to s 400 E Street, Turn South. Turn East on Mill Creek Drive. Stay straight past the cemetery and continue on to Sand Flats Road and to the entrance to the Sand Flats / Slick Rock Park entrance (fee area). The trail starts at Camp Cluster E. Remember the trail is on both sides of the road. Experience Fins and Things at night with the 1000 Lumen ThumperJockey MegaLight. Dirt Bike Lights available for Motocross bikes too.